LASP has extensive laboratory facilities that allow our engineering staff to develop, assemble, build, test, clean, and calibrate the components and instruments that we build on-site. Each laboratory has distinct specialized uses. For example, visitors to LASP often note that we have nicknamed two of our laboratories the Black Lab and the Yellow Lab; these facilities are designed—and “decorated”—to allow testing under specific light conditions. A list of on-site LASP laboratories, together with technical specifications, follows. There are five electronic assembly workstations set up for hand and surface mount soldering; and assembly of flight-printed circuit boards, cabling, and subassemblies. Assembly stations are equipped with microscopes, Metcal soldering stations, anti-static hand tools, and test equipment. The Assembly Laboratory is fully ESD-controlled, safe, and environmentally stable. The electronics test area is fully equipped with ESD Floors, ionizers, and ESD other control surfaces. The main test area has four ambient pressure test chambers: Three Tenney test chambers (-73°C to +200°C test capability) as well as an Envirotronics thermal test chamber (-67.8°C – +177°C). The laboratory is an environmentally controlled area where certified personnel mix and apply bonding materials, conformal coatings, encapsulants, and other polymeric materials. Equipment includes bake-out ovens, vacuum chambers, microscopes, scales, and application instruments. A soldering station and Class-100 laminar flow bench are also available for assembly or PCB repair. The cleaning lab is equipped with ultrasonic tanks and a de-ionized water rinsing station. A 360 degree Fahrenheit drying oven is available for special applications. Vacuum bake-out facilities are described in the Vacuum Test Chamber section. A vacuum bake-out chamber, 22 inches in diameter by 42 inches long, with a 6-inch turbo pump capable of 10⁻⁷ torr range and temperature up to 100 degrees Celsius is also available. The metrology lab is environmentally controlled in temperature, humidity, lighting, filtered air supply, minimal room vibration levels, and environmental cleanliness. All surfaces in this lab (walls, floors, etc) are matte black to reduce any reflected light during light-sensitive testing. LASP has facilities for photometric calibration of instruments, optical components, and detectors and a variety of NIST secondary standard detectors to allow cross calibrations of detectors over a variety of wavelengths. A second type of calibration facility called the Collimated Beam Calibration Equipment (CBCE) can be used to measure the absolute sensitivity and angular response of telescope-spectrometer instruments using a standard photomultiplier tube that is calibrated at LASP against a NIST photodiode. LASP also maintains a set of standard Deuterium lamps and 1000W quartz Halogen lamps, calibrated at the National Institute for Standards and Technology (NIST). These are used in stand-alone configurations and in conjunction with scattering screens to measure absolute sensitivity of telescope-spectrometers. 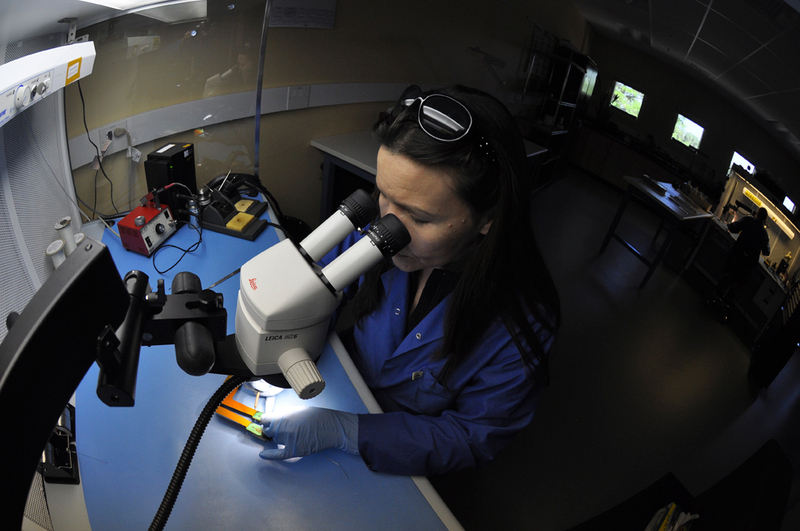 The laboratory also has spectrometers, polarizers, and general optical equipment. All of these test facilities are located in Class-10,000 clean rooms.